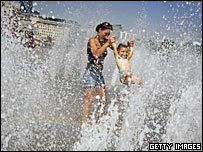 Wednesday was the hottest July day in England ever, with a temperature of 36.5C (97.3F) taken at Wisley, Surrey. The temperature beat the previous record from July 1911 when temperatures reached 36C (96.8F) in Epsom, Surrey. Earlier on Wednesday the record had first been broken with a reading of 36.3C (97.3F) at Charlwood, also in Surrey, near Gatwick Airport. 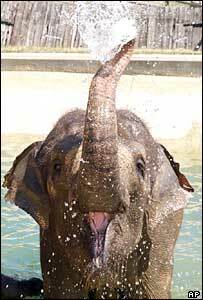 Zoos took special steps to keep animals cool and NHS Direct reported increased calls from people hit by sunstroke. Many schools across England were forced to close because of "unbearable" heat. London's Heathrow Airport had seen the highest recorded temperatures on both Monday and Tuesday, and on Wednesday the thermometer there recorded its highest ever reading of 35C (95F). As the heat rose Zoo keepers were giving animals treats to keep them cool. Animals were given regular hosings down and sprayed with dirt, which acts as a barrier to the sun, while they were fed with specially made ice blocks containing fruit - or for lions, blood. The RSPCA said it received hundreds of calls reporting dogs left in cars and other hot places. Two dogs died in the heat - a golden retriever in a garden without shade in Oxfordshire and a whippet left in a car in Warwickshire. Hundreds of people in Nottinghamshire and Derbyshire had no clean water early on Wednesday, after garden sprinklers left on during the night emptied small reservoirs faster than they could be refilled. Severn Trent Water said consumption in its area had risen by 200 million litres per day, the equivalent of 800,000 extra people. The hot weather has affected public transport with trains on the West Coast Main Line, between London Euston and Lancaster, restricted to 90mph for safety reasons. Speed limits had already been enforced on some parts of the London Underground, where passengers were advised to carry bottled water. 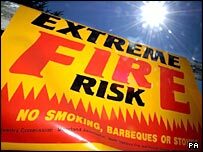 Visitors to the Peak District National Park in Derbyshire were banned from venturing off footpaths by officials fearing the hot weather could cause fires in dry woodland areas. It was the first time access to the moorland had been restricted since open access under the Countryside and Rights of Way Act was introduced in 2004. NHS Direct said it was dealing with between 2,000 and 2,500 extra calls per day, with many being people wanting advice on the heatwave. It said less than 1% of the calls were from people with symptoms of sunstroke, but calls from people with those symptoms had risen from 42 on Sunday to 70 on Tuesday. Ambulance service bosses have urged drivers to stay with cars in traffic jams despite the heat. Officials in Essex said a crew had severe difficulties getting to an accident because hot motorists had abandoned their cars to find shade. Dozens of schools across England have closed or are sending pupils home early because of the soaring temperatures. But a 15-year-old girl at a school in Doncaster was told to go home to get her blazer after leaving it at home because of the heat. BBC Midlands Today's weather team faced an unexpected problem on Wednesday - their graphics only featured temperatures as high as 32C and had to be remade with numbers up to 38. Temperatures are expected to fall slightly on Thursday with showers bringing relief to some eastern areas - but most of England will still be hot and sticky. The highest temperature ever recorded in England was 38.5C (101.3F) in Faversham, Kent, on 10 August 2003.